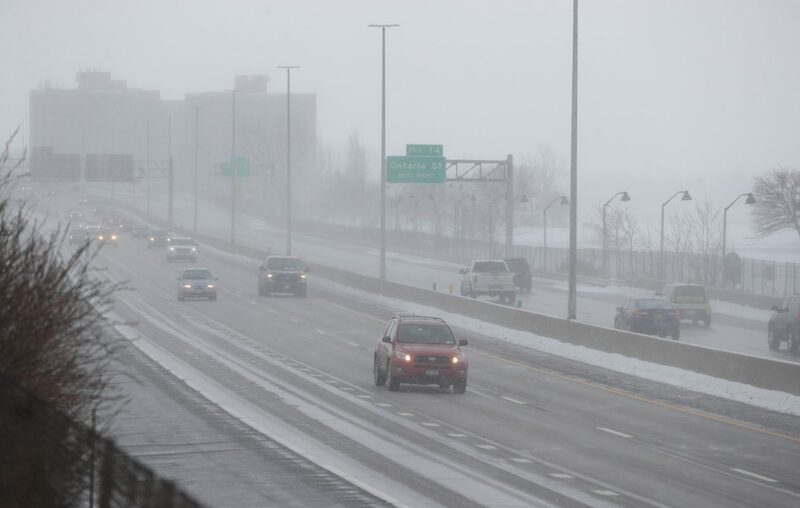 Issues with visibility, as opposed to accumulation, characterized Monday's intermittent bursts of "moderate to heavy snow" that moved across metro Buffalo, according to the National Weather Service. The snow band was located along a line from Kenmore to Batavia to Rochester, the weather service said. "It was primarily confined, for the most part, to the east-west portion of the Thruway and northward," said Steve Welch, a meteorologist with the National Weather Service at the Buffalo Niagara International Airport in Cheektowaga. "Areas around Kenmore, and areas like Lockport and areas like Akron, eastward, had some periods of moderate to heavy snowfall, reducing visibility. Reduced visibility was the more impactful concern," Welch added. Visibility dropped to about a quarter-mile in some areas, such as Niagara Falls. However, no significant accumulations of snow were recorded, Welch said. "There were coatings in many areas, but we haven't had too many reports of snow accumulations," he said. Similar flurries broke out Monday morning and dropped 0.8 inches of snow at the Buffalo Niagara International Airport – boosting Buffalo's seasonal snow total to 114.9 inches. Scattered flurries were possible overnight, with lows forecasted in the low 20s. Mostly sunny skies are expected Tuesday, with highs near 40. Forecasters said temperatures are expected to return closer to normal by Wednesday, with chances for showers in the late afternoon. "Mid to late evening on Wednesday, we'll start seeing increasing chances of rain showers and then we'll get some cooler temperatures Thursday morning that may change it over to a mixture of rain and snow," Welch said. Light snow is forecast for the early morning commute Thursday, he added.